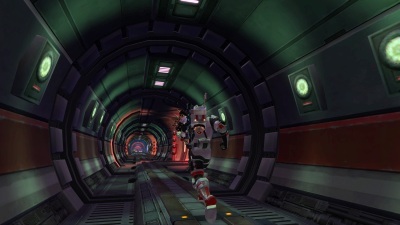 How did you get into gaming and into the MMO genre? I have been gaming since the early Nineteen Eighties when my father brought home an Atari 2600 Video Games console, so from then on games have always been part of my existence. 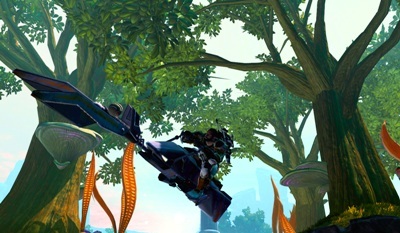 The MMO genre was something that started in 2004. A house buddy of mine was into Star Wars Galaxies which I tried for a few days but just couldn’t get into it. When he began the World of Warcraft beta my interest changed. It looked smooth, fairly lag free (seeing the FPS issues with SWG at Mos Eisley was a bit turn off), and easy to control, I waited a few months after it was released and then I bought it. MMO appreciation then continued. The guild was just recently formed last month. 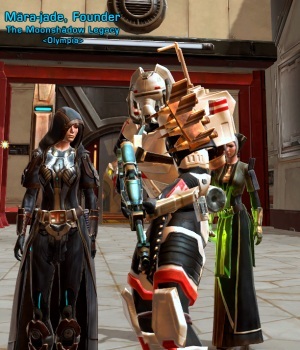 What led you to start a guild in SWTOR, rather than joining another guild? For me at least joining an already established guild isn’t appealing at all. I always feel like just another name on a list of already established members and I don’t enjoy that. Re starting TOR after many months of not playing meant a fresh start on a new server although I had Sith Empire characters on a different server I rolled Republic. Initially I met a chap on the Ord Mantell planet and we hung out for a few days doing missions and eventually bumped into Stefanie whilst she was playing her alt Eleniore on Coruscant. We had a good time and we kept in a group and began chatting like we had been playing online together for years. It was a nice thing to happen especially after re starting TOR. A matter of hours later and we were forming a guild almost as a “why the hell not” attitude and Olympia was formed. “I joined Olympia because i was there when we started the guild. 😛 It’s great to help new people that are starting the game. Love the star wars universe myself. As a newly formed guild, what have been some of the biggest hurdles in forming a guild? 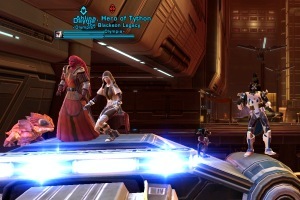 How has the guild creation process gone in SWTOR so far? Initially, I wanted to set the guild up as a place for players to be relaxed and feeling good about being part of Olympia with no pressure to get to level 50 and contribute as soon as humanly possible. I also wanted good types not ones that joined up not caring about what we set the guild up for. To ensure we had types I was interested in for Olympia, I made a requirement to read our web page intro, then register on our site first, before accessing the guild. We wanted players to make the effort to sign up meaning that the lazy “oh CBA” types didn’t join which is exactly what I wanted. Those players can stay far away from us. Unfortunately, there was some typical hostility on the planet chat, after we advertised these requirements, as it seemed too extreme for a social guild to expect registry, which I completely disagree on by the way, yet, we were new and numbers were small and some of our members thought I was putting up a barrier for a new guild membership so I started to relax the requirements to fill up the numbers. What are some issues you have run into that have made the process easier and/or harder in this game? Harder or less effective is the useless official forums, with the lack of realm forums by individual name. We currently reside in a mass of recruitment threads, many of which break the code of conduct by “bumping” their own threads to get back to the top…which is something I haven’t done. Without the guild tools we have come to get use to, from other franchises, this has guild advertising down to various forum sites dotted around the web, which may get seen and may not. BioWare must improve the guild features very soon. What led Olympia and you to this game? Where can the guild be located as far as server and which faction? For me it was BioWare’s previous RPG games like Dragon Age: Origins, Mass Effect and of course World of Warcraft. Combined it seemed like it was going to be great. Most of our members are ex WoW players and many Star Wars fans so these combinations seem to have attracted more and more over the last year despite the bad press this game has had. Olympia is a Republic guild on The Red Eclipse EU PVE server. Are there some guild features, you would like to see added to this game? Indeed there are. A guild featurette very similar to the one WoW has. A guild legacy system similar to what we have in game with our characters so that our play time adds to the guild reputation and can offer guild rewards in Flashpoints and Warzones. As far as creating a guild, what are some tips you could offer to our readers? How much time and/or expense does it take to run an effective guild in this day and age? It depends on the level of guild you are trying to create. You could simply form a guild and have nothing but in game guild chat to create events. I took the Enjin guild tools to task and set up a guild website which was very easy to create and I’m not an internet guru by a long shot. Think about what you want as a guild and why it needs to be created and go from there. 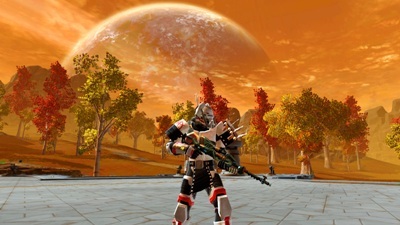 How does the guild feel about the upcoming Free-to-Play option coming to SWTOR? With F2P our officers have spoken about the possibility of larger numbers of players that may join the server and we have already prepared for doing large amounts of advertising when it goes live in order to increase our numbers due to the influx of new people online. What is your current main character class/advance class? Do you play many alt characters? My main is Gryzor an Assault Trooper whom I PVP with whilst our membership arrives at the level cap which I will switch back to shield and tank in end game. I did play many alts but have removed most of them now as my focus is Gryzor. I noticed on your website, that many of your members come from several different countries. Has this been another obstacle or adds a great dimension in diversity to the guild? As an EU guild with membership from various parts of Europe there hasn’t been any conflicts of interest or even language barriers as we all speak English. I like that fact that there are various nations playing as it may get a little stale if we were all from England where I am from. Most guilds have rules to help keep the guild’s membership moving towards a common goal. What are some of the rules your guild has implemented? The language used in guild chat is where I most focused our rules on. We promote a safe and friendly environment so we don’t accept the language you can witness online especially on the capital ship. It isn’t acceptable for decent folk to witness a member talking absolute filth or trash and I dealt with it promptly and decisively. Is Olympia currently recruiting? If so what classes or advance classes is the guild looking to add to the membership? We are always looking for good people out there. We have no actual requirements as such but we will need more people to embrace the healing and tanking roles as most prefer the damage role to level with. To anyone looking to help join and help grow with your guild how is the best way to contact you and your officers? 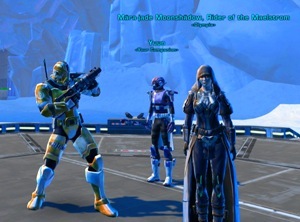 Those looking to contact us can either go in-game to talk to me (Gryzor) or Mara-Jade or Akerorr or go to our website. When you think about this guild in terms of 6 months from now and even a year from now what do see as achievable goals for Olympia? It’s a little difficult to establish what may happen in 6 months or further with all the layoffs at Bioware and the conversion to Free-To-Play but if our membership continues, we will play, and do as much as we can together, as often as we can. There is never a need to rush content and I’m a firm believer that if expansions are released and new level caps arise, we don’t have to skip the “old content” at all, like many others do by perceiving the content that was once end game as old rubbish. Olympia will experience it all, as long as our members wish to do so, I’m always keen to see everything eventually, even if many perceive it as old hat. I like to think that we will get to enjoy all aspects of the game without the urgency that many of the guilds on our server put players through, and as we don’t want to encourage a stressful environment here at Olympia this guild’s goals can be taken in our stride keeping the fun in gaming as it should be. We are not a second job or a second life here we are a community that enjoys games together. That’s it for Community Checkpoint. I want to thank Gryzor for all his help with getting me into their forums, replies and emails. For a new guild or any guild a good leader is essential…Olympia has such a leader. I also want to thank all the other members of Olympia for the warm welcome into their guild and helpful responses. If you happen to be over in Europe on the Red Eclipse server, this might just be a guild for you to check out! How can you be a part of Community Checkpoint on Corellian Run Radio? Just drop me an email at jason@corellianrun.com, and tell me about your guild or server event. Please also include a website address, so I can gather the details and info to share with the community. See you all next week on Community Checkpoint! When I clicked the link for their website, it says it is not there / does not exist. Is their domain correct? Ohnoto, thanks for the comment and checking the link. That is or was their guild’s website when I did the article. I am looking into the issue. They may have been forced to change guild name etc. When I find out more I will be sure to update their page.